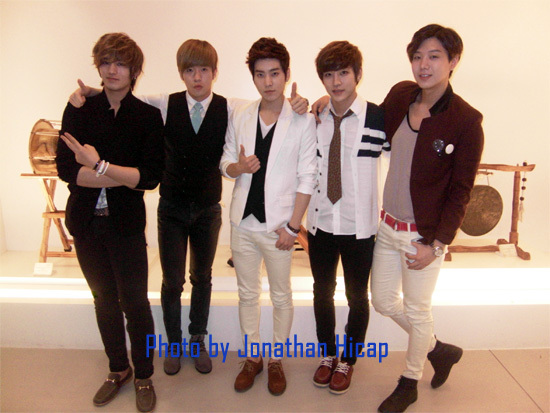 MANILA, Philippines - In 2012, Korean boy band F.CUZ embarked on a new direction in their career. "We traveled to different countries so it's really memorable. We went to Japan, Taiwan and now we're here in the Philippines," said F.CUZ leader Jinon, in addition to releasing a new album. Bulletin Entertainment interviewed F.CUZ on Dec. 28 at the Korean Cultural Center in the Philippines where members talked about their career, plans for 2013 and their stay in the Philippines. F.CUZ and A.Cian are in the country to perform at the 4th Annual Philippine K-pop Convention, slated today at PICC Forums 1, 2 and 3. Their free performances are for the benefit of Gawad Kalinga and Philippine Animal Welfare Society (PAWS), the beneficiaries of the K-pop convention. 2012 is a memorable year for F.CUZ. Their new Japanese single "Drawing Heart" ranked in the Top 10 on Tower Records Japan and Oricon charts last June. Also, their single "Dreaming I" topped the daily and weekly Taiwan's Omusic K-pop and J-pop charts last August. F.CUZ (pronounced as Focus), composed of Jinon, Daegun, Raehyun, Kan and Yejun, debuted in the K-pop scene in 2010 with the single "Jiggy." The band's name originally meant a mix of four. This year, F.CUZ is now known as "For Century Ultimate Zest," which is also the name of the group's new mini album. The album contains the title track "No. 1," "Answer the Phone," "Rise Up," "Janus," "Good Luck" and a its DJ Rubato remix. "We tried a lot of new things (in this album) so it will be fun to choose a track according to (one's preference)," Jinon told Bulletin Entertainment. F.CUZ arrived in the country last Dec. 25 and despite that Filipinos were busy celebrating the important day, fans went to the Ninoy Aquino International Airport (NAIA) to welcome the boy band. The band said they spent Christmas eve with their families in Korea. "We spent Christmas eve with our families. We arrived late at night so we just took a rest. I really thank Filipino fans who came to the airport," Jinon said. Jinon, Raehyun, Kan and Yejun all went to Anyang High School of Arts, which was also the school of pop star Rain, Wonder Girls' Yubin, BEAST's JunHyung and MBLAQ's Seungho. Daegun attended the Seo Seoul Life Science High School. Before debuting in F.CUZ, three of the five members appeared in dramas. The group's first mini-album was "No One," released in Korea and Taiwan in 2010. This was followed by "Gorgeous," which was released in Korea, Taiwan and Japan in the same year. Asked how F.CUZ is different from other boy bands, Yejun described themselves as "model idols." "We have different characters," he said. For their free showcase at the 4th Philippine K-pop Convention, F.CUZ said they "prepared energetic numbers." Fans who purchased F.CUZ's "For Century Ultimate Zest" album will be entitled to the meet-and-greet and album signing events and have the chance to have dinner with the boy band at the K-pop convention. The 4th Annual Philippine K-pop Convention, organized by the Philippine K-pop Committee Inc. and affiliate Philippine fan clubs, in partnership with Standards Appliances and co-presented by Globe Prepaid, aims to gather about 6,000 K-pop fans in a day-long fun-filled celebration. The convention will have F.CUZ and A.Cian as special guests and will showcase booths, talent contests and performances, K-pop Look-A-Like Contest, fashion show, and the 4th Philippine K-pop Awards. F.CUZ said for 2013, they will visit countries and release a new album. "We are going to perform in Korea and other countries as well so please wait for our upcoming performances," they said. F.CUZ members, who will be in the Philippines until Jan. 8, thanked their Filipino fans for their warm welcome. "I thank you for welcoming us and I hope to come back again so please wait for the next time," Kan said. Yejun said, "I thank Filipino fans. Next time we will prepare more performances and events." "Thank you for giving us a lot of interest. Please support us," said Raehyun. Daegun said, "Thank you and we will express our gratitude on stage." "We will come back to the Philippines again so please look forward to our next visit," Jinon added.